There's been a lot of discussion about optical disc burning on Low End Mac this past week, initiated by Dan Knight writing about a problem he had getting a disc he burned on one of his Macs to work on a photo kiosk. Dan, who like myself avoids using Windows unless it absolutely can't be helped, initially suspected the problem was an inability of Mac OS X to burn discs that are readable with Windows systems. As it turned out, that was not the case, as a substantial number readers wrote to point out. I learned a lot about this topic that I hadn't been aware of before, both from reading the responses and some investigation of information resources referenced. For example, I'm now informed that by default OS X 10.4 produces discs using an HFS+/ISO 9660 hybrid format with HFS+, ISO-9660 with Rock Ridge, and Joliet with Rock Ridge, although it (and previous versions of OS X) do not burn disc images that contain MS-DOS formatted volumes (such as FAT-12, FAT-16, and FAT-32 formats). I'm still somewhat hazy on what all that means, but I understand that the upshot is that discs burned with Tiger's default format should be readable on any Mac, Windows PC, Linux system. Cool. The issue of cross-platform compatibility was something that I had been peripherally aware of, but I never really took the time to check it out in any detail before. Most of the disc burning that I do is for my own use or for other people who have Macs, so Windows-compatibility had never been an issue that impacted me personally. Happily, I'm now assured that it's not a problem if I ever do need to burn discs to be read on Windows computers. Macs have historically done a pretty good job of supporting a reasonable degree of media compatibility with the DOS and Windows orbits, although the reciprocal has seldom been the case. Back in the days before the Internet, when floppy disks were a common data transfer medium, I used to keep a lot of stuff on DOS-formatted 1.4 MB floppies for convenient transfer with PC-using editors and publishers. My Macs, of course, would happily format the floppies as DOS volumes, and they worked just fine for storing both Mac and PC formatted files. The ability to burn optical discs conveniently in the OS X Finder, particularly to make identical copies of, say, software install CDs and DVDs for backups via master disk images created by using Disk Utility, is one of the great things about OS X.
I have a DVD burning SuperDrive in my 17" PowerBook G4, and FastMac SuperDrive expansion Bay modules (4x and 8x respectively) in my two 550 MHz G4 Pismo PowerBooks. Actually, it's the Pismos that do most of my disc burning. The FastMac SuperDrive upgrades have been flawless performers and contribute a big part of keeping the old Pismos reasonably contemporary and useful. The SuperDrive units (which also support the earlier PowerBook G3 Bronze "Lombard") are modestly priced, and aside from adding disc burning capability, they can also make ideal replacement units for the sometimes troublesome OEM DVD-ROM drives that came with the Pismo. While I have a very decent external FireWire CD burner, it is certainly a great convenience to have disc-burning capability built-in, especially if one takes their 'Book on the road - and the facility to burn DVDs opens up a whole new dimension of possibilities. The FastMac SuperDrives are slot-loading units, unlike the Pismo's stock, tray-loading DVD-ROM drive. Consequently, it changes the appearance of the right front corner of the Pismo slightly, and it doesn't quite have the finished look of the OEM drive or even the VST modules, but it looks perfectly fine to me. This SuperDrive upgrade burns DVDs at 8x speed (that is 8 times faster than Apple's original "SuperDrive") and rewrites DVDs at 4x speed. It also writes to DVD-RAM discs at 3x speed, CD-Rs at 24x speed, and CD-RWs at 10x speed - essentially equivalent to the SuperDrives offered in PowerBooks, iBooks, and the MacBook Pro. I understand it is the same Matsushita (Panasonic) UJ-825 internal mechanism. The FastMac 2x through 8x SuperDrives do require installation of a little freeware software driver called PatchBurn, developed by Christian Möller in REALbasic 5.2 using the MBS-plug-ins written by Christian Schmitz. PatchBurn is included on a CD bundled with the drive. PatchBurn is a tool to patch existing CD/DVD drivers (under Mac OS X 10.2.x) or to generate and install new device profiles (under Mac OS X 10.3.x and later). Which version of the software you install depends on which operating system version you're using. Running OS X 10.3 and 10.4, I've used the PatchBurn driver included on a CD with the drive units, but you can download the latest version from the PatchBurn Website. Both units have performed flawlessly for me, and they are, of course, much faster than the Pismo's original DVD-ROM drive. Designed to replace Apple's original optical drive, FastMac's 8x DVD±RW drive is compatible with all Apple PowerBook G4, iBook G4, PowerMac G4 Cube, iMac G3 Slot-Load and iMac G5 models. As previously noted, optical disc-burning on the Mac is pretty simple, never more so than with OS X 10.4 "Tiger", but the OS still doesn't support convenient multisession disc burning. Basic disc burning with OS X 10.4's Burn Folder feature is reasonably straightforward. In a nutshell, in order to burn data from your hard drive onto a CD or DVD, you create a temporary folder on your desktop called a burn folder, then drag in file icons, which creates aliases of the original files which remain where they were, undisturbed. This beats the pants off having to drag or copy the actual files into a folder prior to burning as we used to have to do, and for routine disc burning it's all the software support you're likely to ever need if you don't mind using a fresh disc for each burn, often likely to use only a fraction of its capacity. Mac OS X does support multisession burns, but it's not a really convenient process. You have to create a folder containing the files you want to add to your multisession disc, open Disk Utility, choose File > New > "Disk Image from Folder", select your new disk image and then "Images > Burn." You will also end up with multiple disc icons on your Desktop when you insert the burned disc, which is inelegant and can be confusing. While optical media is relatively cheap these days, wasting disc space just rubs me the wrong way, and also results in an increase of disc clutter. It's also an organizational advantage to be able to append subsequent burns to the same disc. If you think you will be doing a lot of multisession burning, a more graceful and convenient solution than the one described above using Disk Copy is BurnAgain DVD, a €17 demoware application by Thomas Bauer of Vienna, Austria, that makes burning multisession CD-Rs and DVD-Rs really easy. BurnAgain DVD is the latest iteration of a formerly CD-only application that was called BurnAgain (and before that BurnItAgainSam), but now supports DVD+RW compatibility, although it of course still works with CD-R and CD-RW discs too. Note well however that there are four possible "flavors" of DVDs: DVD+R, DVD-R, DVD+RW, DVD-RW. Only DVD+RW and DVD-RW are currently supported by BurnAgain DVD. With BurnAgain, you can easily add or update files on your already burned disc without creating the usual sort of confusing multisession disc that mounts multiple disc icons when inserted. BurnAgain DVD makes disc burning more like writing to a hard drive. It simply adds files to a disc several times without creating a volume for each session (but without erasing anything). BurnAgain DVD supports the use of aliases and Tiger's "Burnable Folders". Files or folders that already exist on the disc will be evaluated automatically and newer files will be burned, overwriting the previous versions*. The name of your disc can be changed with each burn. At any time you can decide to start over and hide the content of previous sessions. During content collection, BurnAgain is capable of resolving aliases and supports using Burnable Folders in Tiger. To simplify the use of BurnAgain for backup purposes, each disc stores its own source setup and BurnAgain loads this setup when the disc is inserted. The format of discs burned with BurnAgain DVD is also Windows and Linux compatible, and as a bonus BurnAgain DVD allows you to change the name of your disc at each burn if you wish. If you are using rewritable media (CD-RW or DVD-RW), you can also use BurnAgain DVD to erase the media. Technically speaking, BurnAgain DVD burns ISO-9660 Joliet rock ridge standard CD-Rs that are readable on any platform. Although you can also use other programs to create a CD-R that is then appendable by BurnAgain, the easiest way to do it is to use BurnAgain from the start. Unfortunately, BurnAgain DVD can't add files to closed discs that have been burned using the Finder or other CD-burning software. However, it can preserve resource forks if you install /Developer/Tools/SplitForks (part of the Developer Tools bundled with Mac OS X.) For why this may be important, see below. BurnAgain DVD can burn the same folder of files repeatedly, and will only write over files that have changed or files that have been added to the folder since the last burn, which is handy for backups. To simplify reburning of backups, BurnAgain DVD optionally stores what you want to burn on the disc and loads the configuration automatically when the disc is inserted. That way you can update the content of your disc with one click. One caveat is that BurnAgain DVD is suitable for burning discs that will be used for storing computer files (including music files), but not for making playable DVDs or audio CDs. Thomas Bauer also offers SmartBackup "lightweight daily backup" software that is designed to work harmoniously with BurnAgain DVD. 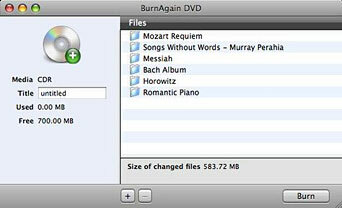 I've found BurnAgain DVD to be a pleasingly intuitive and user-friendly application. If you want to remove items from the list, just select them and click remove or hit the "Backspace" or "Delete" key on your keyboard. BurnAgain DVD will do its stuff. It will prepare the content for burning, burn the disc, then verify the disc. If the disc was not empty and already contains items with identical names, BurnAgain DVD will analyze which files have changed and burn only new or changed files files to the disc, overwriting older versions - files with the same names names on the RW disc will be replaced by the ones you are burning, pretty much the way it used to work with floppies in the old days. After a disc has been burned, the application shows you how much space has been used and how much space is left on the disc. You can now add more files and burn again, with, as noted, all of the files appearing together under the same CD or DVD icon as if you had burned them at once. If you check the "hide previously burned files" checkbox, the disc will only show the files added when the next burn has finished and look as if you had used an empty disc. In general, only discs that are not "closed" are appendable. BurnAgain DVD cannot turn a closed disc into a appendable one. If an already burned disc is appendable or not, depends on what program you originally used to burn your CD-R and how you configured it. BurnAgain should only be used to append ISO-9660 CD-Rs. An option available in the application preferences panel lets you store the latest burn item configuration on the disc. When it is enabled, BurnAgain DVD stores the items you selected for the recent burn on the disc in an invisible file. This setting will be reloaded automatically by BurnAgain DVD when you insert the media the next time. This is useful if you burn frequent updates of the same items. Enabling this option will then save you from having to add the same burn items each time. 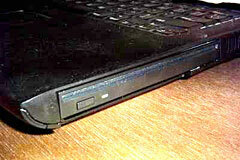 I've tested BurnAgain DVD with both my 1.33 GHz G4 PowerBook and my 550 MHz G4-upgraded Pismo PowerBook. I also tried burning a disc on one machine and then appending another burn using the other 'Book. BurnAgain DVD worked flawlessly throughout, the only distinction being how astonishingly faster the FastMac 8x SuperDrive in the Pismo is compared with the 2x unit in the 17" AlBook. I found this program fast, slick, and a pleasure to use. Resource forks are a special feature of the HFS file system that was used under Mac OS 9 and earlier. For Mac OS X, developers are advised not to rely on resource forks any more. Unfortunately, resource forks are still used by a few applications to store their data. The ISO-9660 file system that is used by BurnAgain for Windows compatibility does not support resource forks, and the resource forks of your files will not be burnt onto the CD-R in the standard setup. Actually there is a way to store resource forks on an ISO file system by using a special format (which simply stores the resource fork in an additional invisible file). BurnAgain does support this trick using a tool provided with the Mac OS X developer tools. You have to install it yourself. BurnAgain will automatically detect if this tool is present and use it. which comes with your developer tools. BurnAgain DVD comes with a concise but helpful online help manual, and, as I said, it's so intuitive and elegantly simple to use, you probably won't need much help anyway. BurnAgain DVD burns an ISO-9660 Rock Ridge file system. Disks need to have that standard and must not be closed in order to be appendable by BurnAgain DVD. Deletion of individual files is not possible. Each session added requires a session overhead up to a few MB. When burning DVD-RW, the "size used" shows an allocated size that may not yet be used entirely by the content.